In this chapter, we briefly introduce a set of tools (mostly free and publicly available) and methodologies that can be used to collect, analyze, and visualize data from OSINF , Facebook , YouTube , Twitter , Blogs , and other sources. We will point out where you can get these tools, the capabilities of each tool, and how we used it in our research. 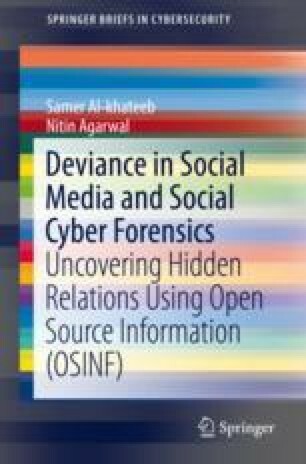 This chapter is meant to give an overview of the tools currently used to conduct social network analysis (SNA) , social cyber forensics (SCF) , and text analytics . We will not cover the details of all the features/capabilities for each tool in this chapter—as some tools may require a whole book by themselves, but we will highlight each tool’s importance and point out the available resources to interested readers. This chapter should help readers finding answers to some research questions using various tools for data collection, analysis, and visualization.